I’ve been a YNAB user since 2011. When YNAB announced “the new YNAB” I was excited, but they couldn’t get my bank account to sync with it, so it didn’t make sense to move to the new subscription model when YNAB 4 was working just fine for me. Now that it’s been over 3 years since the initial release I thought I’d give it another try. The very first thing I noticed was how different they handle future transactions now, and it makes it absolutely useless to me. 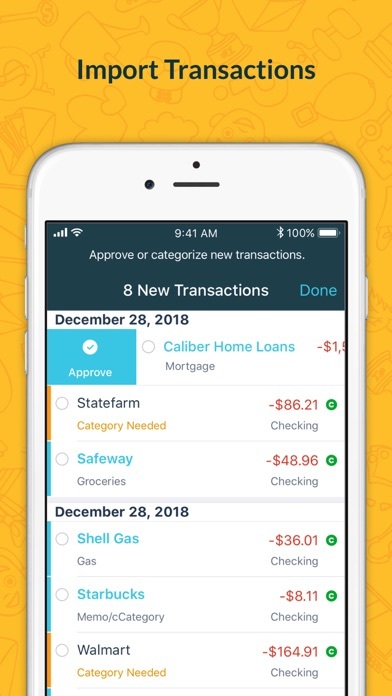 If you put in future transactions on the dates they will actually occur, you can’t trust any of the numbers YNAB shows you. You can be misled into thinking you have money available to spend, and because there is no running balance in account views (and future transaction aren't accounted for until they happen) you'll never know you're going to overdraw an account, or overspend in a category until it's already happened. Let's set up a very simple dummy budget. I have 1 checking account and 2 categories: Giving and Spending. I know, this is a bad decision for the real world, but bear with me. I make $2000 and deposit into my checking account on April 1. I now have $2000 available to budget. I decide to put $1000 in spending and $1000 in giving. Cool. budget done. Checking account balance = $2000, my two category balances are $1000 each. YNAB shows everything is great! Let's say I pay a $1000 mortgage via ACH on the 15th, and a $500 charity donation also via ACH on the 25th. I enter them both in my checking register, and they show up as future transactions. I look at the account view in YNAB, and it says I have $2000, and still says I have $1000 in each of my categories. But wait, I already spent $1500. True, it hasn't actually come out my account yet, but I have already spent it. It's committed. It's happening. I budgeted for it, and decided to do it. But, YNAB still insists I have $2000 in my checking account, and $1000 in each of my two budget categories. Today is the 12th of the month. I go to a charity event and feel like I should donate some money. Being a good YNAB'er I know I need to check my BUDGET (not my bank account balance), so instead of opening my banking app, I open YNAB. It says I have $1000 in giving, and I really like this cause. Since YNAB is supposed to tell me what I can do today, I trust it, and write a check for $1000. Let's say I do nothing else for the rest of the month. The 15th comes and my mortgage gets taken out. The charity deposits my check. On the 16th when I check YNAB, it shows 0 in the bank account, and 0 in all my categories. The 25th comes around and the other charity I committed to tries to take out their money, and either can't, or I get over-drafted and my bank charges me overdraft fees. YNAB failed me because it told me on the 12th that I had $1000 that I could spend in giving, when in reality I only had $500. It gets worse when you have multiple accounts. Let's say you have a checking account and a cash account. I check my budget on the 12th and it says I have $1000 in giving (WRONG) but the charity only accepts cash. I double check my bank balance and it says, yup, you've got $2000. Cool, I withdraw $1000 in cash and transfer it to my cash account in YNAB. At the last minute I decide to only give $500 (even though YNAB tells me I could give $1000 if I wanted to, and record that in YNAB too.) But, I don't deposit the cash because YNAB hasn't given me ANY indication that there's anything wrong. If I check my "accounts" view, I show $1000 in checking and $500 in cash. I check my budget view and everything looks great! $1000 in spending (wrong, I already scheduled my mortgage payment, remember? ), $500 left in giving (still wrong... I already spent that $500 so it's really zero!). On the 16th everything still looks fine (Checking balance=0, cash balance=500. Spending category=0, Giving category=500.) But even if I don't spend any other money, at the end of the month I bounce that ACH withdrawal to the other charity, and YNAB didn't tell me until after the fact. Back in the good old days, when I did the budget on paper, I only budgeted the money that I had. Nowadays, online budgets are a projection of the month, no matter whether you have received the money yet or not. I love this budget for the simple fact that I fill categories only if I have the money to do so. It keeps me on track in a healthy way, minus the anxiety caused by funding categories without money on hand. Plus the peace and joy when funding retirement means the world to me. Thank you a million times over, YNAB! This is the best method of budgeting and keeping track of what you do with your money. The app is simple, effective, and easy to use. Love it! I have been using this app for two years and it has helped me so much! I got the app when I decided to go back to school for a graduate certificate and I didn't want to pull out any more loans. Two years later I got my graduate certificate, I paid it all in cash, I paid down some of my debt, I saved for future expenses, and I have never felt so in control when it comes to money and finances. I recommended it to my mom and now she's been able to pay down consumer debt. I highly recommend this app. Great app and always being updated. Customer support is exceptional. 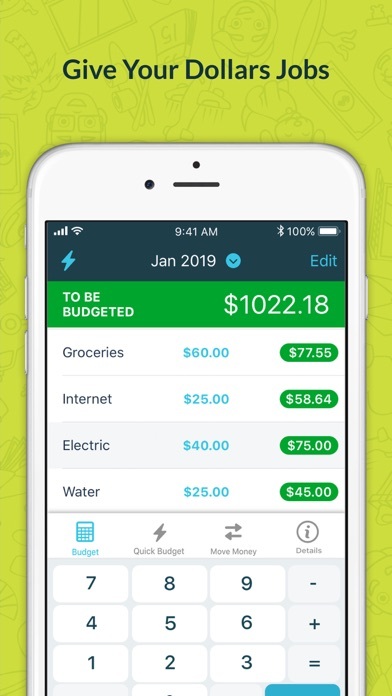 The concept of this app is like no other budgeting tool I’ve ever used. It can take a while to wrap your head around, but there are so many resources available to help you learn, and if you put in the effort you can be fully up to speed within the trial period. After a while it becomes addicting to enter transactions and watch your debt go down while your net worth goes up. Set goals for your savings and always ensure you don’t over spend on a credit card. This app covers it all, but it ALSO has use charts and graphs to show improvements over time. Like I said it’s been completely life changing and is well well worth the annual fee. Give it a try, it might be tough to understand at first, but once you figure it out your life will change for the better I promise. 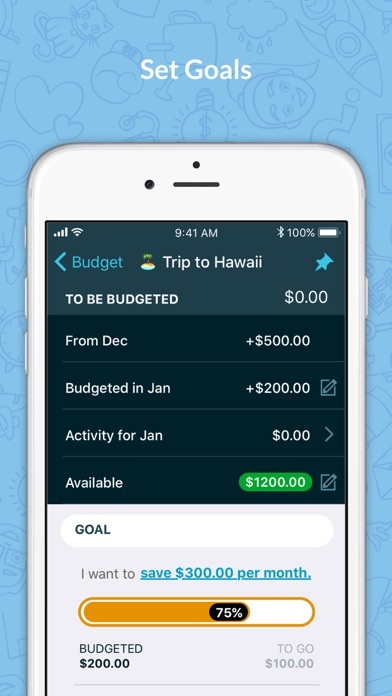 What a great, functional budgeting app! 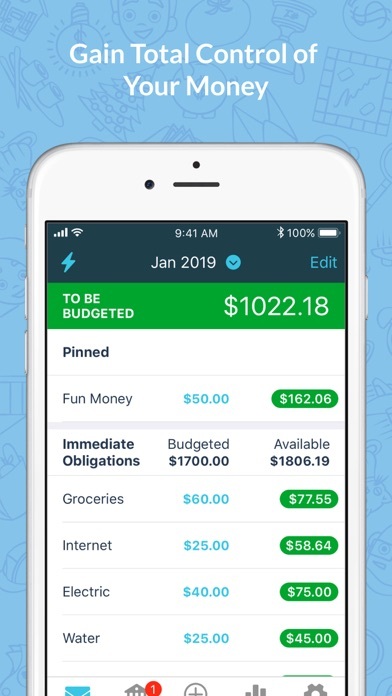 Not only does it categorize every dollar in your linked account, it tracks the “age of your money,” which looks at how close you are to living paycheck to paycheck. After YEARS of living that way, I’m proud to say this app has helped me look at money differently & I am now able to flourish financially! YNAB rocks!!! They always respond quickly and my problems are always resolved in a friendly manner. Wished they’d change the colors they use in the app. It’s getting outdated. Loved YNAB for years but.. ....I have just about had it with the inability for the iOS app to open. Gone are the days when the app just opened and worked straight away. Now I roll the dice and wonder will the YNAB app open, will it freeze for 3 seconds and open, or will it freeze and crash (close). Mostly it’s freeze and crash. You guys are way better than this. Best budgeting app on the planet!!!! Best budgeting app on the planet!!! I grew up in a financially insecure family, which affects one’s attitude toward life, and what you see as opportunities for yourself. You limit your vision of what you can do. This app has and is changing my life. (I’m in my 70’s) I am confident now. I know that I have the money I need. I know what I need, and I am able to be realistic, prepared, prioritized. I love checking in on my budget daily. It’s fun! The fact that it is linked with my bank accounts makes it simple. It takes a bit of effort and time to set up, but so so worth it. I tell everyone about it. Been doing it now for a number of years. You can also take online live little classes daily if you like. Great way to begin getting one’s life under control. Go for it! LOVE YNAB and this app. App really, really needed Touch/Face ID or PIN lock to prevent access by others when sharing phone. I’m so glad this is now fixed! Have been using the app for about 4 months now and am very pleased. Would have given 5 stars but the reporting features are lacking on mobile. The app has been the best budgeting software I have used. Simple and easy way to track my finances each month. Only improvement would be to offer more reporting features in the app (especially the ‘income vs expense’ report!). Best way to manage money thus far, aesthetically pleasing app! The YNAB method is the real win, but the app is seamless and does exactly what I expect as far as transaction entry, prediction of categories, a couple of key reports. Moving money can be a minor inconvenience or take an extra minute to figure out moving money between categories. I use the app consistently, my partner and I both do. I can honestly say that I no longer worry about money now that I’m using YNAB. While I prefer the web interface the app is just as good for almost all tasks you’d want to accomplish. I don't often write reviews, and when I do, it is only because I have used them at least over a year. I have used YNAB for several years now since YNAB 4 for desktop, and it is an excellent budget app. The sync between devices is excellent, as well as the sync with my three banks and 7 accounts. 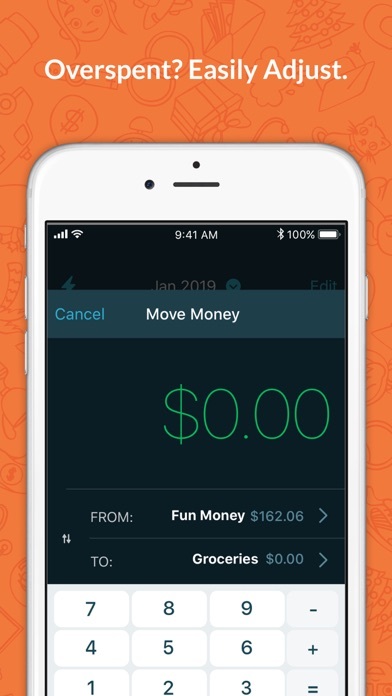 The app nicely and relativity quickly imports all my bank transactions, and is quick and easy to approve each one. YNAB has only improved over the years. The app is MUCH better than it was with YNAB 4! I no longer have any complaints as I did with the previous app. The desktop app is no longer absolutely necessary, but I do recommend it highly. Well done YNAB, keep improving. YNAB and the app has completely changed my relationship with money and budgeting. I’m now a planner and saver. I know where my money is going and can prioritize. Can’t say enough about this program. YNAB is hands down my favorite budgeting app. I finally understood where I was spending my money after I started using YNAB. I’ve been using every day for 4 years now, and I can saw it’s had a huge impact on my finances for the better. I put everything on my visa and get points and pay it in full every month. It auto imports all expenses and eventually % March you don’t have to categorize . Budgeting on iPhone, Apple Watch, iPad and laptop is easy and I have all my assets and liabilities and with all my accounts I have been so much better living on a budget. Also amazing videos and teaching YNAB method will let you live saving for all sorts of items and before you know it you have a $1,000 in your car fund and when you need new tires or break no sweat! I have two months of pay in savings this budget is so good!! Try it and watch all the videos and web help, they have funny sayings all over the site. Some accounts don’t import but they try really hard and better than quicken mint auto import. I’ve tried them all and none come close to YNAB from Budgeting perspective. The product has transformed how I think about managing cash flow, savings, and credit cards. And the company provides support that goes beyond “tech” and into budget education. They have it figured out! Amazing! I have been using YNAB 4 since 2013 and it changed by financial life. I upgraded to this version in January 2019 and the improvements are definitely worth the subscription price. Highly recommended to anyone wanting to take charge of their own finances. Be careful to NOT download the app unless you want to use the app and be willing to pay $7 a month through your iTunes account. It AUTO BILLS unless you unsubscribe before the trial period. Scam tactics is NEVER rewarded. Beware an app that uses shady tactics like AUTO BILLING/ AUTO RENEWAL. This app gives me nothing but headaches. It’s great for the first month because it’s so simple. And you feel really taken care of because you’re constantly getting messages from a friendly face. But once you pay and month 2 begins, things get very confusing, and support disappears. Simple things like adjusting my account is not straightforward. Once I figure something out, but the next time I need to adjust I’ve forgotten the steps. We’ve been using this for five months now and definitely our favorite (and after much trial, only) budgeting program. The app is generally great, but is missing two key features: undo button, and search option. There is no way to undo your last action, or last say 4 actions; there is also no way to search for a particular transaction. You have to go to the web software for that, which is a bummer since we use the app for nearly everything. Hope YNAB is listening and adds these two crucial features. The app itself could use some work-- it has improved over time-- but the real rating is for the system. Nothing worked for me before. YNAB is the best method I've found for managing my money.